How many wild horses will die before BLM gives them shade? RENO, NV (June 30, 2013)–With the western heat wave in the triple-digits, captive wild horses are at risk of heatstroke and death because they have no shade. Close to 1,800 native wild horses are ‘processed’ and eventually transferred by the Bureau of Land Management (BLM) at the Palomino Valley Center (PVC). Rarely are they adopted due to poor marketing and customer service. The few sprinklers BLM installed this weekend are not only a waste of water during the drought, but appear to be a BLM publicity stunt to water down public outrage spreading across social media. Wild horses are not going to be cooled off by a random sprinkler in select pens. They might roll in the mud but most skidish wild horses will be scared of sprinklers. Emergency shade is needed urgently. 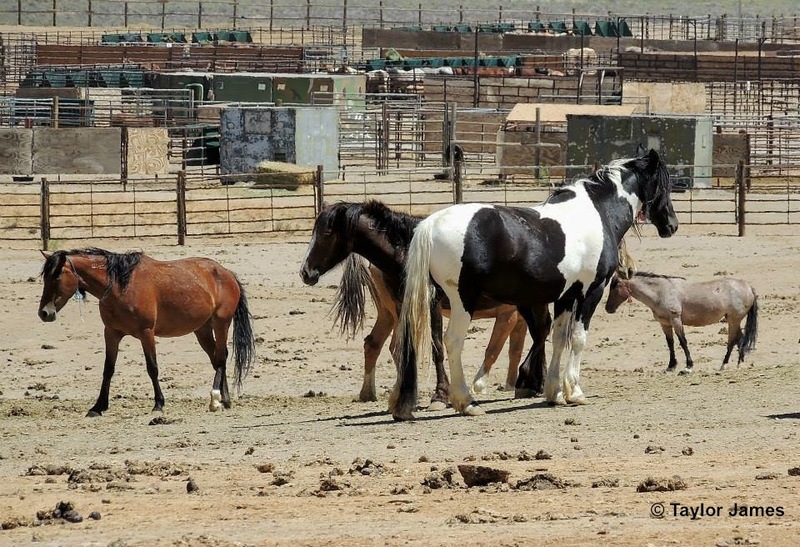 The June 9th press release requesting shade for captive wild horses had been ignored so Anne Novak, executive director of Protect Mustangs and Nevada Senator Mark Manendo contacted BLM officials in Washington last week requesting emergency action to create shade. An equine facility about 8 miles up the road provides shade for the equines in their care. The BLM requires adopters to provide access to shade for adopted wild horses and burros. Why is the mega facility exempt from basic horse care? The Department of Interior and the BLM have access to engineers who can easily solve the shade problem. The BLM employees are paid to care for the wild horses and burros–yet without shade their job is doomed to failure. How many unbranded wild horse foals die during heat waves? Facilities such as Palomino Valley don’t keep track of the unbranded young dead foals according to their public affairs officer, Heather Emmons. The BLM needs to solve the problem they created by rounding up and stockpiling American icons of freedom in the pens. Fertility control is premature as there is no evidence of overpopulation according to the National Academy of Sciences. Triple-digit heat waves can cause heatstroke and death for equines left out in the sun with no shade. According to the article on heatstroke in Overheating and Heat Stress in Horses by Gary P. Carlson, D.V.M., PhD. Life saving care involves taking rectal temperatures, lowering body temperatures rapidly in the shade using fans, hosing down with water, applying ice packs and water enemas–hardly possible for treating untamed wild horses. The BLM’s minor sprinkler mitigation appears to be a publicity stunt to avoid bad press. The sprinklers won’t cool down heat wave temperatures. Most pens are huge and don’t have sprinklers. The majority of wild horses won’t get sprinkled because they will run away. What the wild horses need is access to shade. The BLM is responsible to care for wild horses and burros humanely after rounding them up. If the BLM can get funding for their “emergency” roundups then they can allowcate funding to create shade as needed for the 50,000 captive wild horses. The BLM needs to be responsible for all the wild horses and burros they have captured. Leading grassroots equine advocates Anne Novak at Protect Mustangs, Jaime Jackson at AANHCP and notable filmmaker Carl Mrozek urge Secretary Jewell call for a moratorium on roundups and scientific population studies before controlling fertility of wild horses and burros. Recently, the National Academy of Sciences stated there was no evidence to support the BLM’s claims of alleged overpopulation. Independent estimates conclude less than 18,000 wild horses remain in all 10 western states combined–on an area spanning more than 30 million acres designated by Congress for wild horses and burros. Protect Mustangs is devoted to protecting native wild horses. Their mission is to educate the public about the indigenous wild horse, protect and research American wild horses on the range and help those who have lost their freedom. This entry was posted in Uncategorized and tagged Mustang, public land, Sally Jewell, Value, wild horses by Protect Mustangs. Bookmark the permalink.